Home › Home and Kitchen › Premium Closable Lid By Glacier Outdoors | Quality Bpa Free Plastic Lid | Fit.. Premium Closable Lid By Glacier Outdoors | Quality Bpa Free Plastic Lid | Fit.. THE ULTIMATE CLOSABLE LID FOR 30 OZ YETI & OTHER TUMBLERS: If you have just got yourself a wonderful tumbler but the lid keeps on disappointing you? Are you fed up with lids poorly made that don't fit well? Do not despair. We have designed and crafted the ultimate closable lid that will fit perfectly on your Yeti 30 Oz tumbler. It is also suitable for RTIC, Kuer, CorpCups, SIC cups and almost any other 30 Oz tumbler cups. Pure perfection, right? LEAK PROOF & SPLASH / SPILL RESISTANT LID: Stop worrying about leakage in your backpacks, your purses, in the baby stroller bag or even your car, with our cleverly designed leak proof lid. The tiny holes on top of it, will allow airflow for smoother drinking experiences without annoying splashing. Invest on this spill resistant lid and enjoy your favorite energy drink without any leakage or messy sticky kitchen floors. Hassle free drinking and totally less cleaning! HIGH QUALITY BPA FREE PLASTIC LID: We here at Glacier Outdoors, have spent endless hours throughout all those years to design a lid that bears both an ergonomic design but is also safe to use. We have carefully gathered only premium quality materials and completely BPA free food grade polypropylene so as to build this lid. You may rest assured that is completely safe for everyday use by you and all of your beloved family members. SLIDING SIP HOLE COVER LID DISHWASHER SAFE & STRAW FRIENDLY: If you are fed up with spending your precious time in the kitchen washing up things, then we got you covered. Keep our lid clean by simply hand washing it or just toss it in the dishwasher and let it do the rest. The slider closure will allow you to direct sipping or use a straw to enjoy your refreshing drink. Just fill in the tumbler, place our greatly crafted lid on top and off you go, hit the gym or the office. SUPREME INSULATING LID WITH LIFETIME WARRANTY: If you hate drinking your beverages neither cold nor hot, like us then you should keep on reading. Being insulated, this lid guarantees to keep your coffee or beer colder or warmer for more hours. Try it today and see for yourself. Since your satisfaction is our top priority, this product comes with a lifetime warranty and a 60-day money back guarantee just in case you experience any issues with it. Tumbler Owners Stay Alert Cause The Most Spill & Leak Resistant Lid Has Finally Arrived! Are you looking for a compatible Yeti lid to go with your Yeti tumbler but thelids around you fail to fulfill this need? Do you worry about lids withunknown material construction that can be harmful to your health? Do youreally need a lid to stop the leakage and spilling nightmare once and for all? If the answer to those questions is yes, then we have the perfect lid for youand your Yeti tumbler that will make you smile from day one. 100% Compatible Yeti Tumbler 30 Oz Lid With Insulating Properties For Long Lasting Effects If you want your beer icy cold while camping and your freshly ground coffeewarm during those cold winter mornings, then this lid can make your dreamscome true. Its insulating properties will trap heat or cold and keep your drink orbeverage cool or warm for the many hours to come. The compatibility with the Yeti tumbler as well as with the other ones on themarket will simply astonish you. The only lid that fits like a glove. Reusable Replacement Lid For Less Cleaning & More Drinking Our lids are highly reusable and you can get a few to accompany all of yourtumblers. Protect clothes and important personal gadgets and belongings withthis spill stop lid. 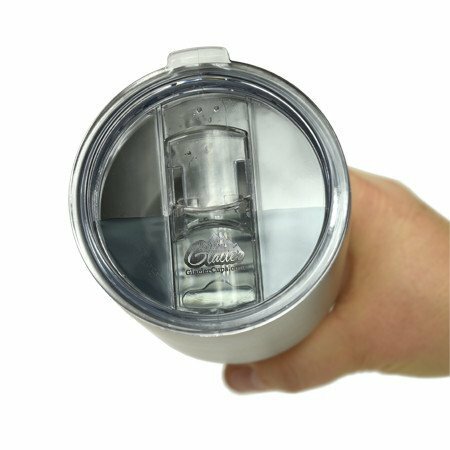 Its crystal clear lid will allow you to see how much liquid is left andcontrol its consumption, just in case you are on a diet. What are you waiting for? Get yours today and a few more for your tumblerlover friends. Scroll Up & Click Add To Cart Now Before We Are Sold Out Again!